I guess you can say I've been on a breakfast baked good kick. Should I be ashamed? Heck no! Breakfast rules. I've also been on a Vegan baking kick. I actually prefer to bake that way, as I don't normally have eggs on hand, and I prefer almond milk to any other milk or milk alternative. Plus it's also heaps of fun experimenting. I suggest you all get your aprons on and start some Vegan baking, stat! 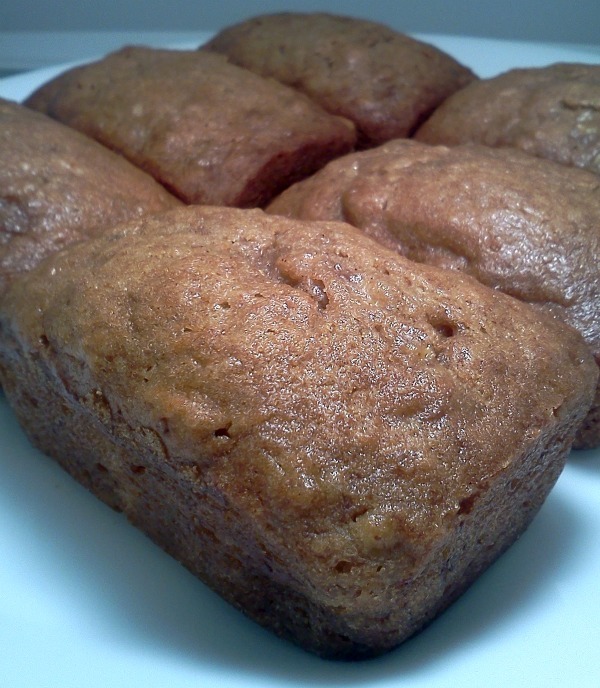 Just like the carrot cake muffins I previously posted, these loafs are DELICIOUS. I actually only had one. Woke up in the morning and a certain someone ate all but two. 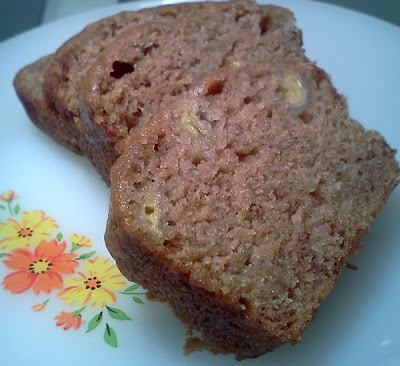 I can't say I blame him though, it really is the best banana bread/muffin that I've ever made and I'm sharing it with you. Lucky yous! This recipe makes one amazing loaf, or you can do what I do and make 8 mini loafs! Preheat oven to 350 degrees. Grease a mini loaf pan, or regular pan if you're making one loaf, set aside. Mix together the almond milk and vinegar, set aside to curdle. Whisk together all of the dry ingredients except for the sugar. In a different bowl combine sugar, oil, vanilla. Mash the bananas in a medium bowl with the lemon juice and maple syrup. Add the banana mixture to the sugar mixture then whisk in the milk mixture until combined. Add the wet mixture to the dry and gently fold until the batter is moist, do not over mix. 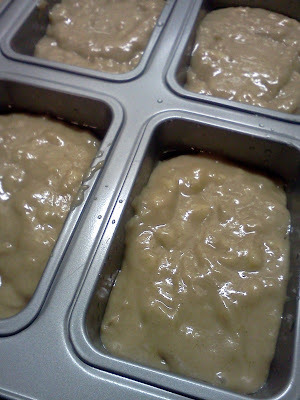 Fill tins halfway full or pour into loaf pan, For mini loafs - Bake for 35 minutes and for one large loaf - Bake 50-60 minutes or until toothpick inserted in middle comes out clean. Please TRY not to eat them all, But I don't blame you if you do! Nom nom nom! I never baked with almond milk; I'll have to try that sometime.